There’s a tracker that your physical education teachers have known about for a long time. Maybe it’s even posted in your school gym now, and you probably don’t know about it. It’s called the FITT principle. This acronym stands for Frequency, Intensity, Time and Type. It refers to a way to track, or monitor your workout progress. This integration fittness tracker is extremely useful, so I wanted to discuss it with you, and show you some of the features inside. When I ran across this idea, I knew that this could help all of us track our arts integration and STEAM efforts. It’s hard to know what we should focus on next, and if what we’re doing is actually producing the results we’re looking to achieve. That’s where this integration FITTness tracker comes in! 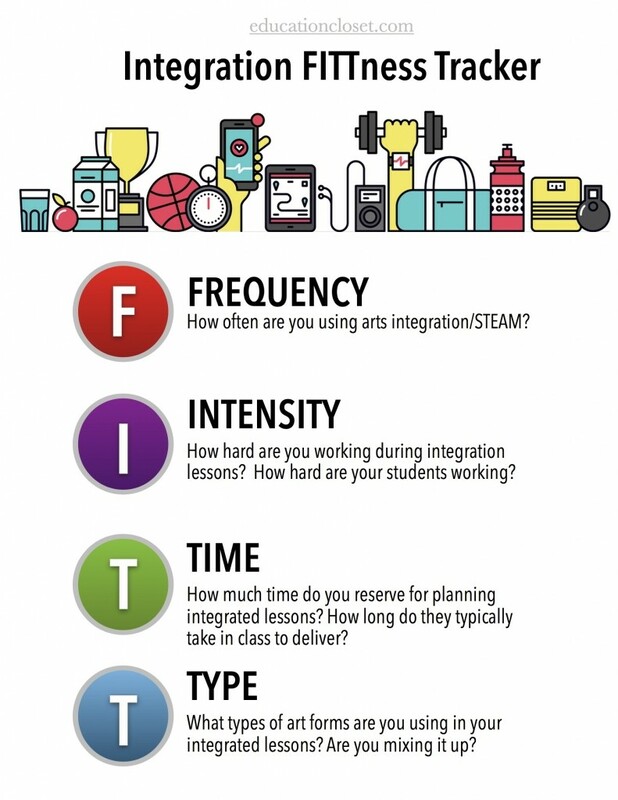 You’ll just check your current work in arts integration with each of these 4 areas. There’s no judgment here! This is simply a way to monitor where you are in your own journey. How often are you using arts integration or STEAM? How hard are you working during integration lessons? How hard are your students working? How much time do you reserve for planning integrated lessons? How long do they typically take in class to deliver? What types of art forms are you using in your integrated lessons? Are you mixing it up? Once you’ve taken some time to review your own efforts, think about how you can use your results to propel you forward. What can you celebrate? Where can you grow? This quick check will keep you arts integration and STEAM efforts on track and healthy all year long! How do YOU monitor your success and what measures do you use like this Integration FITTness Tracker? Let us know in the comments below!